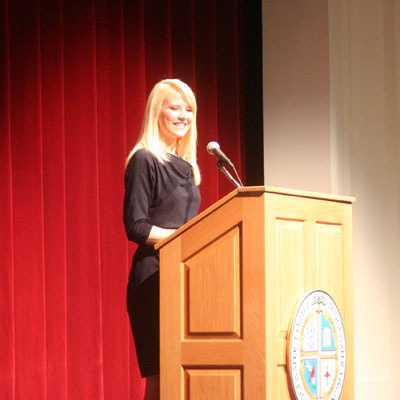 Elizabeth Smart, at 25, has done quite a bit in life. She’s landed a prime gig as a commentator for ABC News. She’s served a Mormon mission in Paris, where she met her future husband, and has a foundation in her name through which she advocates for greater protections for children. That last one is very much personal for Smart, who at age 14 was taken at knifepoint from her Salt Lake City home by a self-proclaimed prophet and his wife, who held her captive for more than nine months. “I couldn’t imagine anything worse. I don’t know how other people would react to it. That’s how I reacted to it,” said Smart, who spoke in front of an overflow crowd at Cole Hall at Bridgewater College Monday night. Her story is one that her generation grew up with as a stark reminder that anything can happen. Smart was home with her parents and five siblings the night of June 5, 2002, when a man who had done odd jobs at the family home, Brian David Mitchell, put a knife to her neck and told her to not make a sound. Mitchell led the teen from her home to a makeshift camp, threatened to kill her and her family if she tried to escape, and otherwise put her through a living hell with no apparent end. “And because I found that, I was able to make the decision that no matter what happened, I’d survive. I didn’t know how long I would be kidnapped for. I didn’t know if I would have to wait until my captors were dead. But because I had something worth living for, I had something to keep me going,” Smart said. Mitchell was sentenced in 2011 to two life terms. Smart had long since come to a sense of peace with what had happened. She has testified before Congress to support sexual predator legislation and the Amber Alert System. Her Elizabeth Smart Foundation has created a program called radKIDS to put the focus on preventing predatory crimes against children. “Instead of waiting for a tragedy to occur, instead of waiting for another Penn State, another Elizabeth Smart, another terrible tragedy to happen, what the Elizabeth Smart Foundation wants people to realize is there are things we can do to prevent them,” Smart said. Her strength in the face of the unspeakable crimes committed against her at such a young and vulnerable age is awe-inspiring. The source of that strength: her faith and sage advice from her mother. “The morning after I came home, she said it was so terrible what had happened to me, that nine months of my life had been stolen that I’d never get back, but that the best punishment I could give him, these people, was to be happy, was to move forward, to live my dreams, to do what I wanted to do in my life, and never let this hold me back,” Smart said. And she’s done that and more. The night she was abducted, she had been set to perform harp at her middle school; she graduated from Brigham Young University last year with a degree in music with an emphasis in harp performance. She’s asked often at public events how she’s been able to pick up with her life and do what she does in the face of what she has endured. “We all experience traumatic things in our own ways, and I think we all try in our own ways to move forward. For me, I felt so lucky to be home again, to have my family again, but it was like waking up from a bad nightmare. I didn’t spend the rest of the day thinking about my nightmare. I moved forward with my life. That’s quite literally how it’s been,” Smart said. “I’m not saying my life is perfect. That would be silly. But for the most part, I’ve just been extremely blessed, to have such a wonderful family, to have such a caring community, to be so loved. That helped me move forward without feeling sorry for myself and feeling any less about who I am,” she said.